State Map ←You Are Here! Welcome to the archive section of our State Capitol neighbor. New Clemons boasts a rather long and unique heritage. You may learn more about the history of New Clemons, Yarnell County and the City of Roaring Falls by visiting our History center one floor up. We only display a State Map here in the State Capitol. 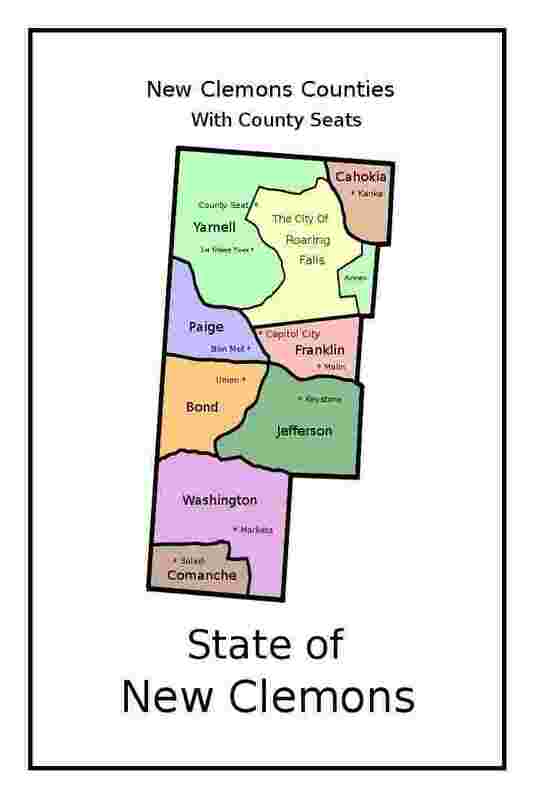 Several other maps may be found if you visit the Yarnell County and Roaring Falls map sections. A brief history about New Clemons follows the map image. By an act of Congress in 1812, the Territory of Louisiana became the Territory of Missouri. Beginning in 1820, the area that would become the Territory of Kansas was set aside as Indian Territory by the U.S. Government and was closed to settlement. In 1825, the peaceful Osage moved from the Missouri Territory to the newly established Kansas Territory, where they were often invaded by Cherokee raiding parties. The Indian Removal Act of 1830, expedited the process of moving the Cheyenne and Comanche south of the Santa Fé Trail, and established the Osage Reservation between the Oregon Trail in the north, and the Santa Fé Trail to the south. Due to problems with the Cherokee, the Osage rarely ventured south of Expedition Trail, and ceded this land back to the U.S. Government in 1835. An unusual provision in a second Treaty, made in 1845, due to the number of trappers who married Osage wives, land south of the Coteaux River was included in exchange for a Float, which allowed mixed-marriage Osage to claim ownership of lands when they became available for sale by the U.S. Government. The Territory of New Clemons became established by this treaty with the Osage; however, due to its remote location, government surveying of the area was delayed until 1843. John Freemont's survey team reached the Roaring Falls area, and upon completion of their work in 1844, counties were organized with the State Capitol situated at the heart of New Clemons, in Franklin County. Less than a year later, based on problems existing further east, the newly charted and organized New Clemons Territory was designated as a Slave Free Territory. Although the counties within the New Clemons Territory were established way back in 1844, in December of 1859, the Provisional Jefferson Territory Government, established the New Clemons Territory as the State of New Clemons. Even though the U.S. Federal Government did not recognize this charter; the people, its history, and their progressive community continues to the present day.